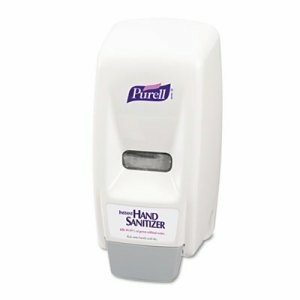 Small size 700 mL manual dispenser is ideal for tight spaces. Large sight window, skylight and crystal clear refill bottles make it easy to check fill status. High-performance antibacterial hand soap delivers luxurious lather and an appealing fragrance. Enriched with a moisturizer, natural extract and skin conditioner. Converts to a locking dispenser at any time by simply removing the key from inside the dispenser. Patent pending CONTROLLED COLLAPSE refill bottles hold their shape as they empty for a more attractive overall appearance. 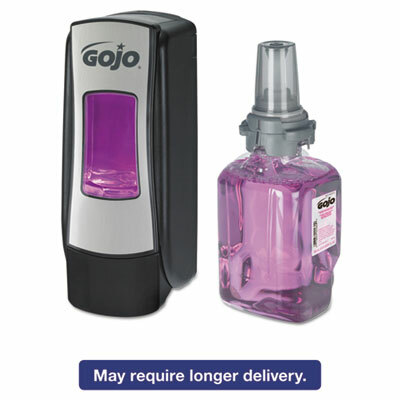 Dispenser Type: Liquid, Manual; Capacity (Volume): 700mL; Holds: 700mL Refill; Color(s): Brushed Chrome/Black. One-hand, portion-controlled operation. Holds Sanitary Sealed� 800mL refills. Material(s): Plastic; Color(s): White; Width: 5 5/8"; Depth: 5 1/8".